Uz navigacijsku kartu dolaze i gratis 3 najbolje nagrađivane igrice od strane American Smartphone and Pocket PC Magazine: ˝GameBox Boards˝, ˝The Corsair˝ i ˝Bowling for Burgers˝. Verzija 8 donosi podrsku za prikaz 3D zgrada, kuća i znamenitosti sto olaksava navigaciju u gradovima. Ako imate uredjaj na kojem ne radi instalacija, idite u direktorij iGO8 i pokrecite program preko "iGO8.exe"
The post was edited 42 times, last by dxdy ( Feb 18th 2010, 9:44pm ). Features:[list] * This skin provides extra functions to iGO8 to facilitate easier route planning and navigation. Installation Instructions:[list] * Install the Speed Camera Voice files by unzipping the "audio" folder and copying it to the iGO8 folder on the SD Card. This will enable the tilt setting options on the "3D Smart Zoom" screen. * Install the skin by copying the "iGo8_Ultra.zip" file to the Content/Skin folder, then select it in the application "Skin" menu. Latest Version 5.0 Modifications:[list] * Updated to be fully compatible with iGO8 Version 8.0.0.49545 dated 30th July 2008. * The unzipped "audio" folder from one of these is required on the SD Card ► "iGO8\audio" ◄ like this. The post was edited 6 times, last by dxdy ( Feb 1st 2009, 10:56am ). 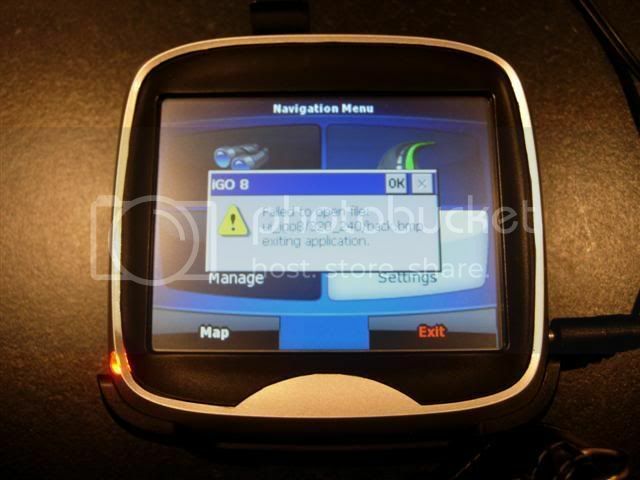 * This skin adds extra functions to iGO8 to facilitate easier route planning and navigation. * Supported resolutions are 320x240, 240x320, 640x480 and 480x640 only. * Version 6.0.4 is available on the current version download page. o iGO8 PDA Version 8.3.2.64029 dated 7th November 2008.
o iGO8 PNA Version 8.3.2.64873 dated 13th November 2008. * Added new lane arrows and red crosses to the signpost information panels making it easier to determine the correct lane(s) to take (see the screenshots page). * Removed the previous signpost coloured backgrounds since these didn't display correctly if the "[feature] signpost_coloring=1" setting was used in the sys.txt file. * Added new lane information arrows and red crosses to match those in the signpost information panels. The post was edited 5 times, last by dxdy ( Apr 2nd 2009, 12:18am ). The post was edited 10 times, last by dxdy ( Apr 2nd 2009, 12:19am ). The post was edited 2 times, last by dxdy ( Jul 19th 2008, 7:15pm ). The post was edited 1 time, last by dxdy ( Jul 19th 2008, 7:42pm ). - The "Routing Methods" button is now available from the "Plan on Map" screen "Cursor" and Find" buttons "More Options..." menu. - The Speed Camera Add/Edit menu now displays the correct units irrespective of the regional units setting (iGO8 bug fix). - Minor modifications to the speed camera voice settings and separate phrase timings for each voice. The post was edited 1 time, last by dxdy ( Jul 19th 2008, 7:16pm ). - Added option to completely disable audible alerts for each separate category of speed camera, accessible via the "Speed Camera Settings" menu. Jedno ptanje: Dali je postupak instalacije isti za HTC DIAMOND posto nema opsebnu SD karticu nego je memmorycard ugradjen u njemu od 4GB. Da li neko ima ubacen iGO 8 u Beckeru 7934 i kako mu radi tj. da li kasni i steka i sl.? Kod mene je trenutno ubacen iGO 6 , i on je sasvim OK , ali vidim da ne izlaze nove karte tj. od aprila nista novo , a za iGO 8 vec cetvrti update !!! Nekad sam znao taj postupa i sada nemogu nikako da se sjetim, pa ako mozes ti ili neko drugi da mi objasni postupak. Istina ovo bi svako trebao znati ali zaboravi se.